Cowboy Poet Mike Puhallo is the real deal so both his writing, and his speaking are very real. He can be very serious, very funny, or very silly, depending on the occasion! He is quick witted, easy to hear and understand, and is always very entertaining! 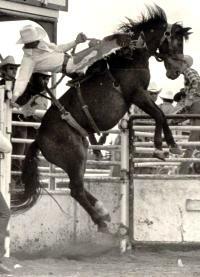 He has performed at cowboy gatherings and festivals, schools, libraries, community halls, at brandings, coffee houses, stock shows, and even Biker's Bar-B-Qs! He has entertained all ages from kindergarten classes to writer's workshops for other cowboy poets and college students throughout the West. Alot of his poems and speeches are based on history which comes from being an avid student of the culture and history of the "real west"! Mike writes all of his own poems and his poetry appeals to a broad audience, not just ranchers and working cowboys! Mike will work as an MC, and does speaking engagements for functions of all types. If you're looking for an after dinner speaker, Mike Puhallo could very well be your man! His wit and humor can add to any event! The Queens Golden Jubilee Medal was presented to Mike by member of Parliament Betty Hinton. Mike received the Will Rogers Medallion Award for Cowboy Poetry Book in 2002 and 2007. The Queens Golden Jubilee Medal was presented to Mike in recognition of outstanding community service. Mike's book "Rhymes & Damn Lies", was awarded the 2007 Will Rogers Medallion Award for Cowboy Poetry Books. Mike was nominated for Parlimentary Poet Laureate (PPL). The PPL role is to encourage and promote the importance of literature, culture and language in Canadian society. Mike's book "Piled Higher and Deeper" received the 2002 Will Rogers Medallion Award. In 2001 Mike was voted in for the third year in a row as one of the finalists for Cowboy Poet of the Year at the prestigious Will Rogers Awards, in Fort Worth, Texas. Mike was also nominated for Best Cowboy Poetry Book and Best Cowboy Poetry Album at the 2001 awards. In 1998 Mike was nominated for Best Western Song (Cinnamon) as well as Best Cowboy Poetry Book of the Year. Mike was selected for the Artscan 2004 Showcase. This showcase features a dozen artists each year and is attended by educators from Western Canada.